There's a few Tandem Twin owners on this forum now although it's always a bit quiet in this section. I've put a link to here on the home page of my site and I try and encourage anyone who emails me to join in. I've noticed one or two new arrivals this week. So, let's see how many there are and see if we can breathe a bit of life into this section. If you've got one, reply to this post, say a few words about you and your bike, what your plans are for it etc. Oh, and mention whereabouts you are too in case you've got some spares up for grabs or there's something you need. hi the names doug just purchased above as a project along with spares once its finished items not required will be up for grabs. watch this space!!! i will try to post some pics once i work out how to reduce the image size. ooh looking for an oil pump cover and radiator cover for fairing and 2 indicators, what you looking for maybe a trade in parts or will buy. Hi, my names Scott, and I'm a KR'aholic. OK, So I've had my Tandem on the road for the last couple of years, and am currently giving it a bit of a make-over as well as trying to sort out a charging problem (stator shorted out I think). Most of the hardware is ready for it's naked conversion, except for the clip-ons which are being machined and the wiring on the digital dash needs to be finished. After that, I want to try to fit a pair of KR1 wheels and brakes so I can get some decent rubber for it. Way down the track (or when I nuke this engine) I'm planning to attempt a 300cc conversion, but that's a loooooooong way off yet. I'm Tim, I'm in the UK, I run the KR250.ORG website which I set up in 2003 after acquiring my first KR. I got that in 2002 as a wedding present. It's been on the road most of the time since then, I've tidied it up a bit as I've gone along, done some basic maintenance but that's it really. 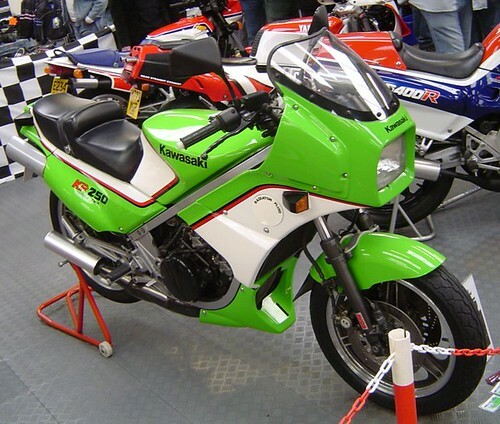 I've displayed it at a couple of classic bike shows. It needs a bit of attention to the brakes, exhaust gaskets and an oil leak at the moment. I bought a crashed KR from a breakers in 2003 to plunder for spares. It's more or less complete, is unregistered and I've never yet tried to get it running. I've swapped over quite a few parts from this one to my others. I was given a dismantled engine in 2005. I also bought a (registered) rolling chassis, which forms the basis of my KR250R project. It's been fitted with a ZXR400 USD front end and KR1 rear wheel, but very little progress has been made since. I've acquired a KR250S powervalve top end with a view to eventually fitting that though. I picked up another KR in 2008 - a red/black one. Bit tatty but it runs and has a UK registration so I'm hoping to put it on the road later this year. I also had a fifth one in my garage for a while - the 'jigsaw'. It was never actually mine though, although I was tempted. I have various assorted spares too, none of which I'm looking to sell but if there's something you really need then I'll help you out if I can. When I get chance I'll try and catalogue exactly what I've got. Last edited by StrokerBoy on Wed Jun 10, 2009 9:29 am, edited 1 time in total. come on guys there has to be more than 3 of us in the UK, how many kr250 tandems are out there i'm intrested are you? Since then - or 2006 - we (Stroker Boy and me) started Diff'rent Strokers just to do some shows and be able to show the KR and a few other oddballs. This all started at Stafford (start at the top!) and is where the first pic is taken and where the KR won a "Commended" The second pic was taken at the Bristol show, where it didn't win anything! If only I had time to ride the damn thing!! I'm actually a pretty long swim away from the UK. I'm also a fair swim from the U.K. I've got one kr 250 and several boxes of spares I haven't ever sorted. I won't post a pic of it as I cast it down the road a couple of months ago. I'll get around to rebuilding it when the weather warms up a bit. I swear it's been snowing in my shed the last few weeks. I own a kr250a1. I bought mine 6 months ago for $140NZ and just about everything was there, it's only missing the battery, rear left indicator, side stand switch and the oiler tube between the oiler pump and intake was broken. I've tried kicking it over to start it (I put premix in the tank with a 30:1 ratio) but it won't start, does anyone have a solution? Apart from that everything else was good to go. The bike only has 14 000 km on the clock and the engine top end has no wear . I wouldn't mind finding a spare bottom end with cranks and rods cheap. ONLY PROBLEM IS FINDING SOMEONE IN NEW ZEALAND WITH SPARE PARTS! 4th run-around bike - GSX600FL with straight through after-market stainless pipes ! Thought I'd post details of my KR, which I've had since 2001. It's a 1984 bike, first registered in 2000 by Bat Motorcycles. It apparently had been in it's crate for 16 years, and I put it through it's 1st MOT! I've only just replaced the original tyres to get it through the test this year, not because of the tread depth, but because the sidewalls were cracking! The only problems I've had were a leaky anti-dive seal, and a split footrest, and both were replaced with Gpz600 parts. I try to get to as many shows as I can, which isn't always easy because of my back injury, where the response is either a complete blank, or surprised curiosity! Pics of the bike are on strokerboy's excellent website (nice one, Tim!). It's no show winner, and invariably gets caned when I do get round to riding it! It's what it was built for, after all! My name is Alfred and I've been an owner/addict since 1987. I lived with and bought my KR in South Africa from a guy who raced it on the GP circuit there. 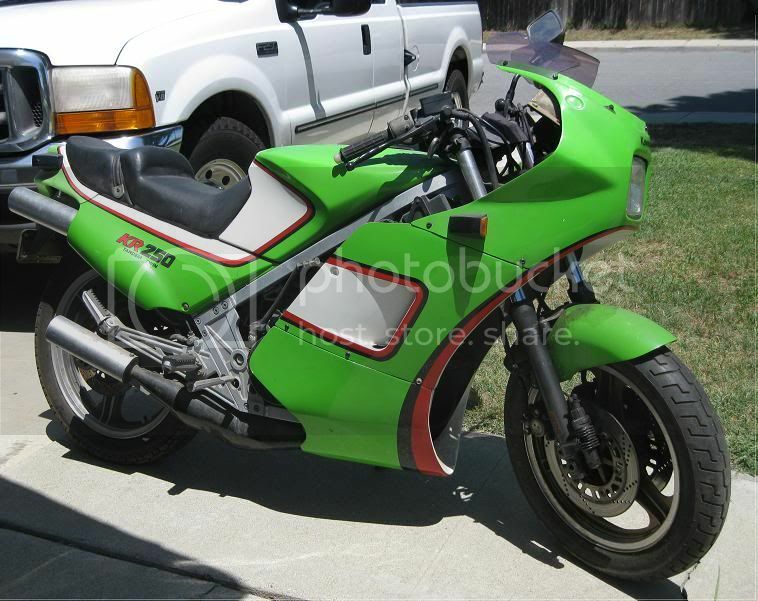 I returned to the USA in 1989 and put a TZR250 fairing, while keeping with the original color scheme. I am moving to Italy at the end of the year and will probably not return to the USA. 2-Stroke road bikes have been banned in the USA since 1978, so it's a treat when you hear the sound and smell of one ride by. She's a bit dirty in the picture. At this time she's torn apart for a major cleaning, brakes and I'm striping and repainting the expansion chambers. I need a windshield and touch up the paint because my brother knocked her over... Oops! Anybody know what kind of mirrors I can adapt to this fairing? And one from the Western State of Oz. I bought my KR a few months ago, was advertised on Tim's site and the owner lives about 30 minutes from me. Mechanically ok, electrics and plastics need a little work. However it runs and is registered. Gets the occasional blat round some nice twisties close to home leaving a wonderful plume of two stroke smoke. Miss the smell of Castrol R from the past though. Solid green in colour, it was going to go to the original colour scheme but will stay as just green for the time being. Howdy. Looks like the previous (current) owner of my bike hasn't posted here so I will. I have bought sight unseen a 1984 KR for $300. It gets delivered next week. 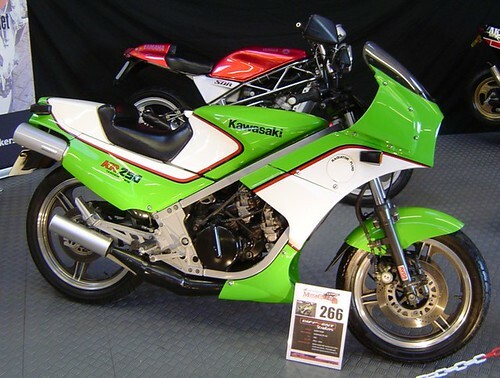 I'm a bit of a Kawasaki tragic so this offer was a good one, and it might make a cheap commuter or a fun occasional track bike if I get it together and going. It's good to have a project although space in the shed is at a premium with my ZXR750J, FJ1100, RGV250 track bike and XR600 sharing space with the ZX9, ZX6 and KDX200 belonging to the better half. And I have a pocket bike too. Anyways, will let you all know how I go with it, and post some pics when it arrives. Welcome... Since you already own a 2 stroke GP bike, you will be pleased with the performance of the KR250. It's magic!